Bees help pollinate flowers that in turn grow foodstuff that is good to eat, like apples and almonds. In fact, if bees were suddenly to disappear off the face of the earth, our food supply would be in dire straits. So one thing we can do to help our friendly bee population is to plant flowers in our backyard, or in a plant box placed on our garage door. Flowering plant seeds can be bought inexpensively for any season at your local home and garden store, and children will have a field day planting the seeds. Just be sure to follow the directions on the packet. Tip: Choose the most vibrant colors! Bees love reds, oranges, yellows, and bright purples. Whenever you flip through old family photo albums, do you ever think of what it might feel like to lose your precious family memories? With digital technology mainly at our fingertips with smartphone features that can scan photos at high resolutions with just a snap of a button, it is not difficult to imagine scanning your favorite precious pictures, especially photos that may be in danger of destruction or a little worn for wear. Sharing your old images is also a great indoor activity to get your kids thinking about their own family's heritage. Tip: You probably can't scan all your photos, so make it a group effort and have everyone select their best pictures. It's a tedious job to clean out your wardrobe, so spice it up and make the event a family project. Inspired by the ideas from Marie Kondō's book "The Life-Changing Habits of Tidying Up," invite you and your family to bring all their clothes into the family room. Go through each article of clothing one-at-a-time and really ask the tough question: "Do these clothes make me happy?" If you don't feel it, toss it. The idea is not to overthink it. You can go first, if you are the head of the family, to set the tone. When you collect all the clothes that you're not feeling, donate your used textiles to a local non-profit that clothes the needy. A mailbox is a practical device used by your postman to deposit your daily mail; but, more than likely, your mailbox could use a drop of paint. Since a mailbox is not an integral component to your home decor, it could be fun to get creative with colors or design. Use stencils, or find a bright color in an unused paint canister in the garage. Make it a tradition and paint the mailbox in different colors depending on the season. Tip: It's a dirty project so make sure everyone wears their dingiest clothing. 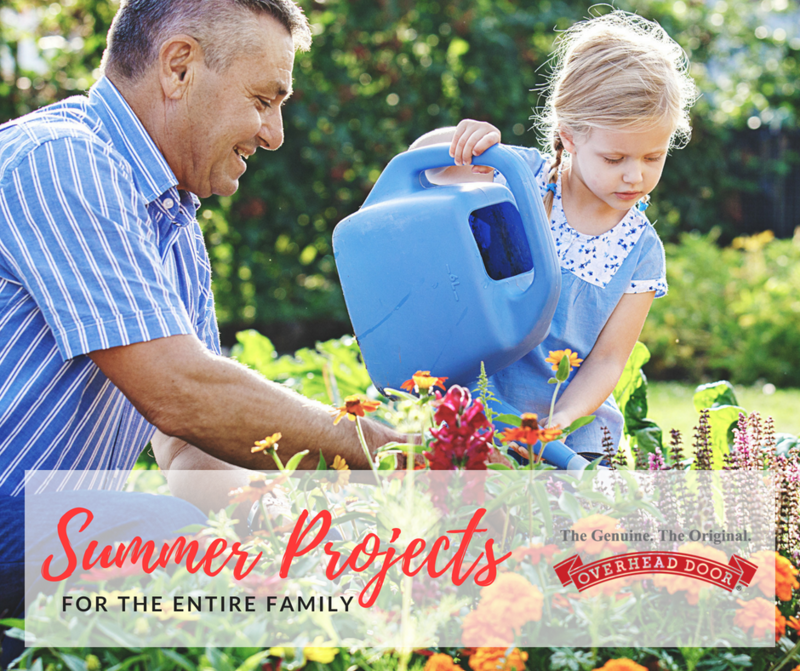 As you can see, home projects can be enjoyable - but most importantly it is a way to get your family together to do stuff that you usually wouldn't do in the busier Fall and Spring months of the year. Do you have garage door updates you need help with but don't know how to start? Send us a messageand well be glad to help you out.